Join us for the 7th Annual Popsicle 5k Run - All abilities are welcome! We have a newly certified course for the race! The route begins at Mocksville Elementary across from Rich Park and goes through Mocksville and the new Greenway. The Race kicks off at 8:30am, with packet pick up and on site registration open beginning at 7:15 am. Not a runner? No worries! Walk the Race Route with your friends. Sign up to be a part of the fun! Raffle - each registrant will receive a raffle ticket with their race number. ZERO K- sign up the morning of the race if you are there to support a friend but do not want to run. You'll get a t-shirt (up to the first 300) and coffee and not have to run an inch! Fun Run- Kids (10 & under) there with a runner can participate in a short race after the 5K has finished. There will also be fun activities for the kids while the parents are running! Popsicle Palooza - Eat the most popsicles in 3 minutes to win the prize! $20 through February 11, and $15 for team registrants. New this year, we have a special category for Go Far Students, and Davie County Athletes and Students. All fees go up to $30 beginning February 11, so register early to save. Plus $10 for each child wishing to participate in the Fun Run. Direct any questions or comments to the Davie Community Foundation at 336-753-6903, or tdaniel@daviefoundation.org. Visit SURF's page of our website to learn more about the SURF Board youth grant-makers! 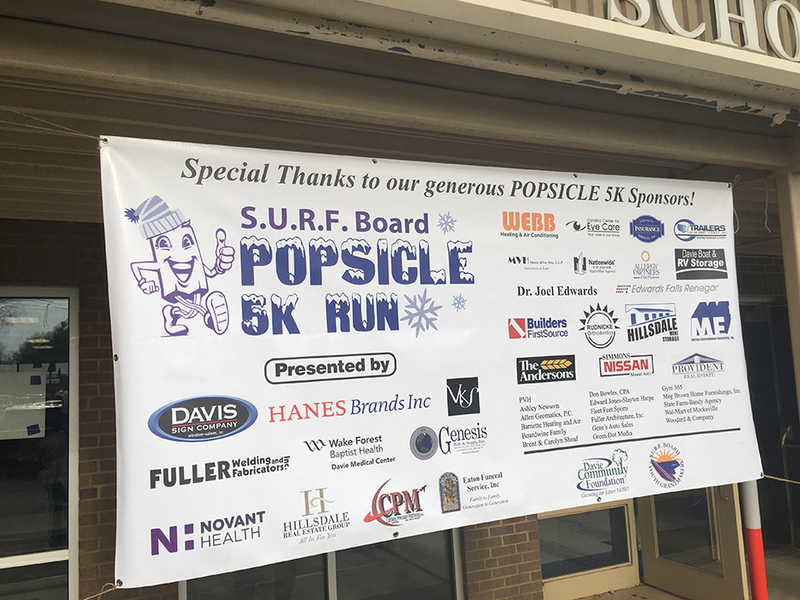 The 7th Annual POPSICLE 5K race will begin at 8:30 am A.M. Race packets may be picked up on Saturday morning (race day) from 7:15 A.M. - 8:15 A.M. There will be great food after the race, as well as raffle prize opportunities for all registered participants.